We have become part of the Real Deal in order to keep our market safer! For details on what this can mean for our consumers and traders, please read the information below! Errol Sunday Market has grown from modest beginnings to become Scotland’s largest market and car boot operation. A wide range of quality traders complement the 250+ car booters to offer an event which draws visitors from across the country. Local markets like Errol are a real asset to communities and a popular national tradition in the UK. They bring social and economic benefits to communities, providing bargains for shoppers, lively attractions for families and visitors, and an environment for legitimate, local businesses to trade successfully. However, markets can also attract illegal traders selling counterfeit and pirated goods. This can have a detrimental effect on local communities with consumers left out of pocket with poor quality or potentially harmful goods, and legitimate businesses losing out as a result. 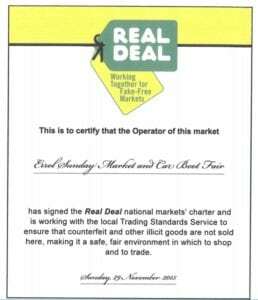 To tackle this, Errol Sunday Market has joined forces with Perth & Kinross Council Trading Standards in a new partnership initiative called Real Deal. Real Deal is designed to support businesses and shoppers alike and give them confidence that their market operates within the terms of the nationwide Real Deal Charter. At the heart of the Real Deal partnership is the National Markets’ Charter, which sets out the key principles for market operators, local authority trading standards services, industry and trademark representatives to abide by. Errol Sunday Market and the Council have signed up to this charter, and also have a local code of practice in place covering practical and operational aspects.